(November 23, Colombo, Sri Lanka Guardian) The announcement made by the President Rajapakse in the budge speech should open the eyes of all professionals in this country, particularly the lawyers and the doctors, who shamelessly indulge in defrauding the public funds by not paying the tax due on their income. The current tax rate on personal income has been reduced, ranging from 5 to 35 percent to 4 to 24 percent. The tax-free threshold income also increased from Rs 300,000 to Rs 500,000 and the tax slabs from Rs 400,000 to Rs 500,000. This in effect carries a clear massage to the professionals, particularly lawyers and doctors, to respect their obligations. The people of this country are fully aware that probably less than one per cent of professionals declare their true income for tax purposes and pay tax on them, widening the gap between those who have everything and those who have nothing at all. It is pointed out that the route cause leading to this problem and so many other problems is the absence of professional bodies to regulate the legal and medical profession that protect the public interests leaving no room for exploitation. Whereas in other parts of the world there are regulatory bodies created by law in place to protect the public interests, it is very unfortunate that in Sri Lanka there is no such measures in place, allowing the so-called professionals to indulge in all kinds of wrongdoing at will. The primary objective of the trade unions created by lawyers and the doctors [Bar Association and the GMOA] in this country is to protect the interests of the members in the respective professions with a scant respect their obligation to the society at large. In Sri Lanka, it is observed that there is nothing in place that prevents lawyers from quoting any fee as they please and charge the fees in hard cash, issuing no receipt at all. And there are no regulations in place to protect the clients’ interests such as issuance of mandatory client care letter at the acceptance of the instructions, setting out the legal issues in the cases undertaken by the lawyers, full breakdown of the fees, the methodology of the computation of the fees and also the rights of the clients with full details of where to report any misconduct committed by the lawyer. In the absence of proper regulatory process, the lawyers in this country are allowed to exploit the innocent client scot-free quoting exorbitant fees. In some cases fees charged running into some millions. Yet, nothing declared for tax purposes. In fact, in this country it is observed that whereas there are a large number of lawyers who earn millions per annum only a handful of them declare their income and pay tax. Now the time has come to put a stop to this abuse and to set up regulatory body by law bringing an end to this antisocial and bad practice. It is observed that in more civilised countries like in the UK, where protection of the public interests is considered to be paramount important, a large member of members in the profession is regularly struck off some times with severe financial penalties imposed against abuses, there is no such process followed in this country. In the eyes of right thinking people, this is clearly a slap in the face of the people, whose sovereign rights are exercised by the lawmakers and the President who have fatally failed to introduce required measures to protect the citizens from endless abuses and also to ensure proper collection of revenue from the income generated by those who engage in legal profession. This is another profession where the members are allowed to enjoy absolute immunity from wrongdoing. Abuses of office by the government doctors who also allowed engaging in private practice are rampant in this country with no process available to deter wrongdoing. It appears that their main concern is the private practice and their responsibility in the public service has become mere secondary. These professionals start their day with the private practice and end the day with the private practice. The extend of abuse is such that some doctors, unless the patients enter to his ward with a consultation through private practice, the patient get only a step motherly treatment at the hospital. It is also observed that only a handful of doctors spent adequate time with their patents because their primary concern is to make maximum income for the day without proper investigation of the patents. Some doctors simply prescribe medication and refuse to spend time informing the patents about the illnesses they suffer from, which is considered a violation of their professional duty and the patents’ right to the information about illnesses and the treatments recommended by the medical professionals. Sometime patents simply die due to medical negligence. In some cases due to sheer failure on the part of the professional to properly identify the disease patents breathe their last breath, but unfortunately as there is no proper regulatory body in place, most of the culprits go scot-free with no sanction, pecuniary or otherwise, imposed on them for the professional negligence. The worse part is the fee collection procedure adopted by the medical professionals where the fees collected is not accounted for. This unacceptable practice applies to all professionals engage in the medial profession where only a handful number issue receipts for their fees. In the event a patient is admitted to a private hospital for a treatment, which could sometime lead to a complicated medical procedure, the hospital fee is charged separately and the doctors fee is charged separately in hard cash for which no receipt is issued. This irregular process is followed for a purpose i.e. to evade payment of tax on the income generated from private practice. 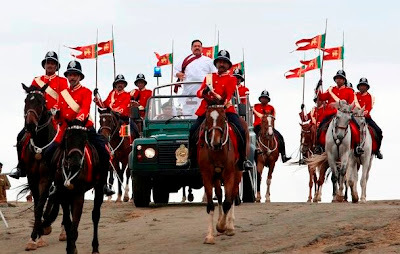 The people of this country who elected President Rajapakse with overwhelming mandate expect the President to use his due diligence to these burning issues and address them swiftly and decisively protecting the interests of the citizens. Whatever the remedial measure taken should address both issues highlighted in this account. One should aimed at protecting the interests of the citizens of this country from the exploitation of the immoral professionals and the other to compel them to respect to the law of the land and pay taxes due taxes on the income generated by them that was denied to government coffers for a very long time.